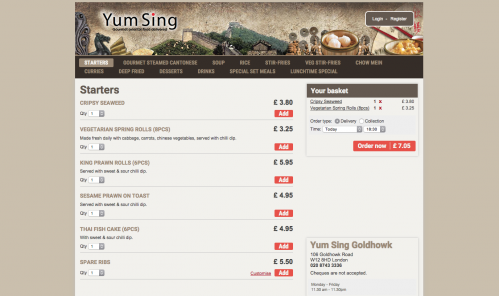 Here is a quick guide to help you create an efficient, professional online ordering site that reflects your restaurant’s identity. LivePepper provides you with a basic template that you can subsequently customize to suit your needs. 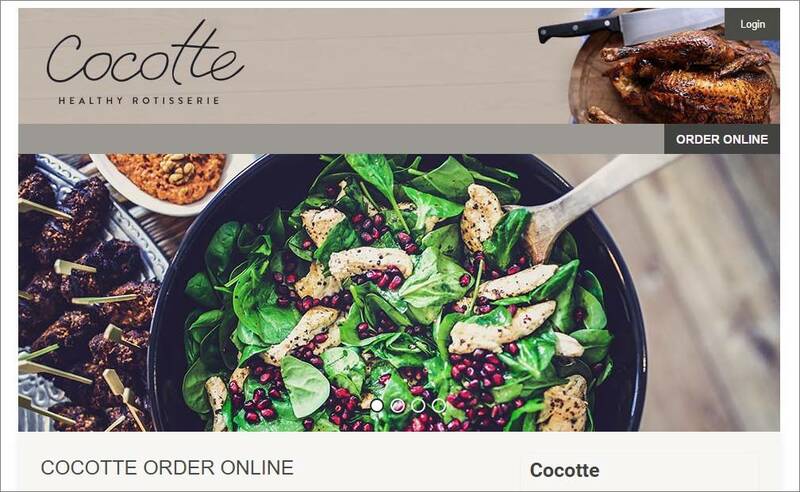 Example with Cocotte: the restaurant manager designed this site in just a few clicks. the homepage: text, information on your restaurant, slideshow photos, social network icons, map on Google Maps, etc. the online products: descriptions, photos, prices, promotions, ingredients, sauces, options, payment method, available delivery method, etc. Need help customizing your template? Contact us and we will guide you with your site’s configuration. Features is immediately available (€59 exc. VAT per month). 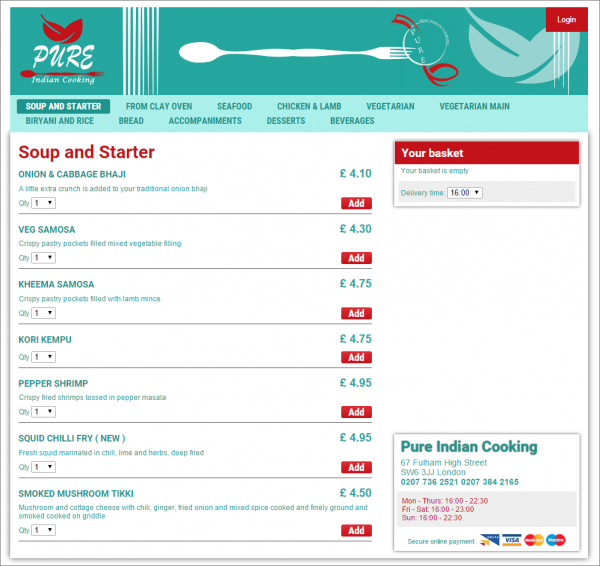 Flexibility for composing your online menu: Create as many product families as you like; add, modify or remove products on your own whenever necessary. Order status: End customers are informed of the status of their orders in real time by viewing your website or consulting their email. You can configure the different statuses in line with your needs and working habits. 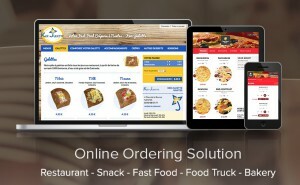 End customer interface: Our solution simplifies the online ordering process thanks to fast response times and easy-to-understand ordering options. 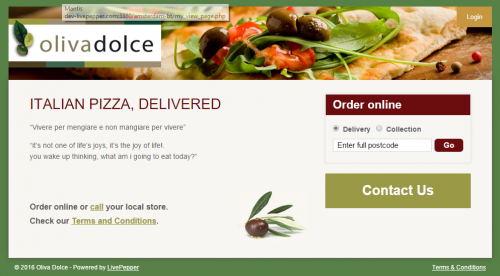 Your customers can create an account, save their delivery address or repeat a previous order, all in just a click. Our solution systematically suggests the best possible offer to the user based on the items selected. Responsive site: The site’s page layout adjusts automatically to the available display space. Customers can thus place online orders indiscriminately via their smartphone, tablet or PC – the display will be optimized accordingly. Bear in mind that 45% of the orders received on our platform are placed via a mobile device (tablet or smartphone). Photos of products: Photos can be added to your products. Note that it is best to include photos for all products. E-marketing campaigns: You can at all times export customer data in a format compatible with the main services for sending text or e-mail messages. Social networks: Your customers can log in to your site using their Facebook ID to avoid forgetting their password. This also facilitates the registration process. Referencing (SEO): The LivePepper platform is compliant with all referencing rules. You can track your referencing efforts using Google Analytics or Google Conversion. This means that you can assess the ROI from a Facebook ad or from Google Sponsored Links. Reports and statistics: The back office provides you with real-time statistics on your revenue history, average basket, number of customers, list of best-selling products, etc. Continuous improvement: LivePepper is under constant development. New features are regularly added at the request of restaurant managers, which will then benefit all the platform’s restaurants. 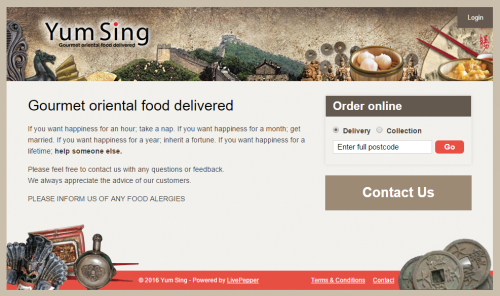 Placing the online ordering system on standby: In the event of any Internet connection problem, the site is automatically placed on standby. This can also be done manually. 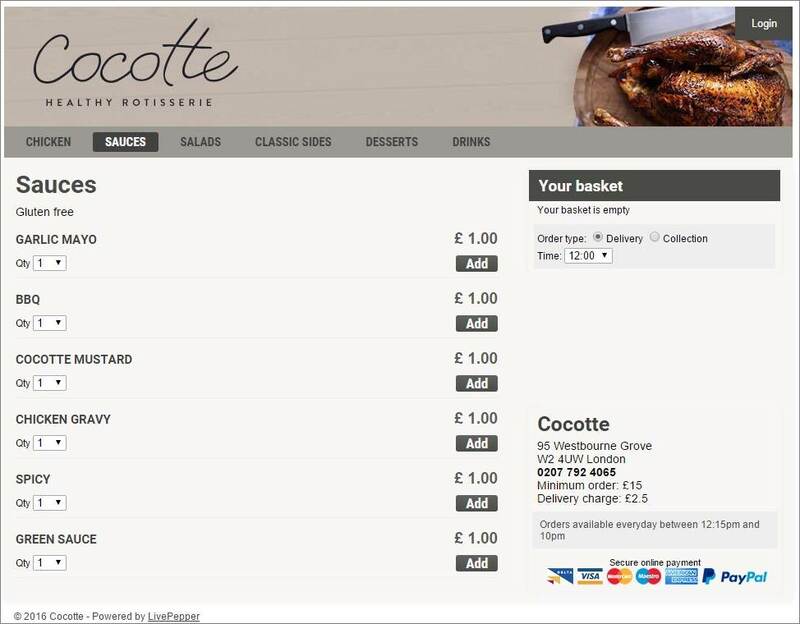 Hosting infrastructure: Restaurant sites are hosted on LivePepper servers. Our servers are redundant; all data is backed up several times a day on a remote server. The domain name (Internet address) belongs to you. Integration with a POS software solution: LivePepper has established gateways with various POS solutions. If your restaurant uses a compatible solution, you could receive online orders directly to your ordering solution and thus benefit from a single database for orders and customers. We regularly set up new gateways. Loyalty programmes: With LivePepper, you can set up a loyalty programme. You define your rules in terms of how your customers get to earn and use their points. Tailor-made promotions: You can create promotions such as: second pizza half-price, Happy Hours on Monday, buy one sushi tray and get one free, 10% discount for orders placed online, and so on. For each promotion, you can define a minimum order amount, valid times/days, and a start and/or end date. You can relay these promotions on the social networks, and provide the corresponding coupon code, if applicable. Delivery price management: You can define different delivery areas and the corresponding prices. For a more precise delivery area, you can even specify the street names where you deliver. Detailed analysis: A detailed analysis of the data will allow you to better target your communication and marketing actions to secure your customers’ loyalty. You can export all data concerning your orders and your customers (name, e-mail address, phone number, purchase history, etc.) in CSV format, compatible with Excel. With LivePepper, this data is your property. Flexible menu creation: You can create your own menus, e.g. a main dish + choice of dessert, with a discount for the customer. Multi-site management: If you own a number of restaurants, you will have access to data and statistics both for the entire chain and for each individual restaurant. Each restaurant’s access is restricted to its own data and statistics. Online payment: The end customer can choose between online payment or payment on delivery. For online payment, you must enter into a distance selling agreement with your bank. The payment gateway which we set up so that you can collect online payments directly to your bank account will be invoiced. If you prefer to use PayPal, you can receive online payments as soon as your site is up and running, without having to notify your bank and at no extra cost. Note, however, that PayPal fees are higher. When end customers add a product such as a pizza, they are invited to add additional ingredients or toppings. 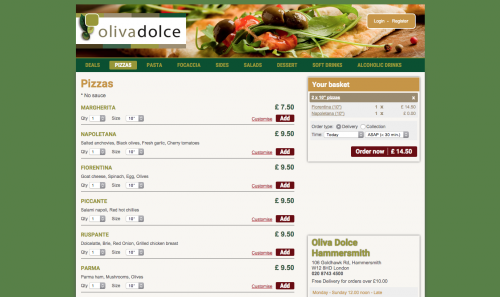 Customers can add a drink or dessert in just a click from the main dishes page. Additional products are suggested based on the products contained in the customer’s basket. Products that customers compose themselves: You can allow your customers to compose certain products for themselves (such as salads, pizzas, pasta, bagels, fajitas, etc.) in three or four stages (1 – choice of base, 2 – choice of main ingredient, 3 – choice of sauce, etc.). Customized e-mails: You can customize the e-mails sent automatically to the end customer to confirm their order, for example to include a satisfaction survey. You can also customize your printed receipts. You can set up a wide range of specific features. Please contact us directly so that we can establish a bespoke quote. Start your free trial now (click on “Free Trial” at the top right of the page).